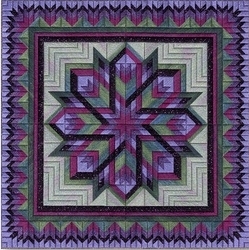 Design Area: 9.78" x 9.78" ~ Materials List: 14" x 14" 18 Ct Canvas, Sandstone ~ 14" x 14" Stretcher Bars ~ Japanese Tacks ~ #22 Tapestry Needle ~ Caron Collection Watercolours, 176 Golden Grains(3), 287 Seaweed(2), 306 Old Brick(1), 314 Ivy(1) ~ DMC #5 Perle Cotton, 834 Gold(1), 976 Orange(10. # in () indicates the number of skeins or cards needed. 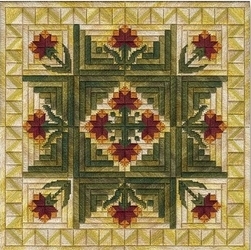 Design Area: 9.89" x 9.89" ~ Materials List: 14" x 14" 18 Ct Canvas, Sandstone ~ 14" x 14" Stretcher Bars ~ Japanese Tacks ~ #22 Tapestry Needle ~ Caron Collection Watercolours, 083 Pine Forest(1), 041 Fir(1), 158 Grape(1 uses all), 236 Appalachia(2) ~ DMC #5 Perle Cotton, 340 Violet(2) ~ Kreinik #12 Braid, 012 Purple (3 spools) ~ Rainbow Gallery Gold Rush #14, WG85C Purple(3 cards uses almost all). # in () indicates the number of skeins or cards needed. 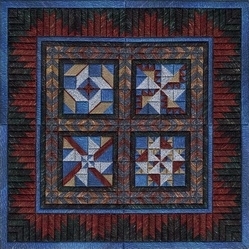 Design Area: 8.78" x 8.78" ~ Materials List: 13" x 13" 18 Ct Canvas, Sandstone ~ 13" x 13" Stretcher Bars ~ Japanese Tacks ~ #22 Tapestry Needle ~ Caron Collection Watercolours, 016 Bark(1), 041 Blueberry(1 uses almost all), 0175 Dark Shadows(2), 306 Old Brick(1 uses almost all) ~ Caron Collection Snow, 16 Gunmetal(2), 27 Shadow(1) ~ DMC #5 Perle Cotton, 841 Taupe(1) # in () indicates the number of skeins or cards needed. 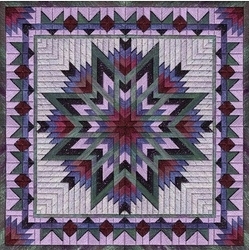 Design Area: 9.89" x 9.89" ~ Materials List: 14" x 14" 18 Ct Canvas, Sandstone ~ 14" x 14" Stretcher Bars ~ Japanese Tacks ~ #22 Tapestry Needle ~ Caron Collection Watercolours, 051 Abalone(1), 060 Slate(1), 083 Pine Forest(1), 158 Grape(1), 232 African Violet(1), 266 Smoky Mountains(1) ~ DMC #5 Perle Cotton, 210 Lavender(2) ~ Rainbow Gallery Silk Lame', SL28 Burgundy(2), Rainbow Gallery Gold Rush, WG53C Violet Blush(1), WG85C Purple(2uses almost all). # in () indicates the number of skeins or cards needed.